NEUCHATEL, Switzerland--(BUSINESS WIRE)--Swiss Advanced Vision (SAV-IOL) has announced the launch of Harmonis, a customizable intraocular lens (IOL) with advanced extended depth of focus (EDOF) optical technology for cataract surgery. For the first-time ever ophthalmologists will be able to use a web-based configurator to define the best optical parameters of the lens to fit with the desired visual outcome prior to surgery. SAV-IOL will introduce Harmonis to the market during the 36th edition of the European Society of Cataract and Refractive Surgeons (ESCRS) in Vienna on September 21-25. To allow ophthalmic surgeons and their patients to achieve optimal vision, the web-based configurator of Harmonis offers a set of selectable parameters for light distribution ratios of near, intermediate, and distant vision, reading distance (Add) and extended depth of focus (EDOF), resulting in more than 3,000 optical configurations. Harmonis sits alongside Eden and Lucidis, SAV-IOL’s existing portfolio of IOLs, offering ophthalmic surgeons a range of high quality, affordable, premium, and now customizable EDOF lenses for cataract surgery. All three products are manufactured using the company’s patented Instant Focus optical technology, designed to extend the depth of focus of intraocular lenses to provide patients with high quality continuous vision. The launch of Harmonis, continues to underpin SAV-IOL’s reputation as a company whose products are built on innovation, quality, and precision. Max Boysset, CEO of Swiss Advanced Vision says, “By expanding our product portfolio with the launch of Harmonis, we are able to offer ophthalmic surgeons and their patients a greater level of flexibility and control by allowing them to choose the best fitting optical configuration based on a stable and proven platform”. The bespoke Harmonis lens is ordered by ophthalmic healthcare professionals using the web-based configurator available at sav-iol.com and is manufactured on demand per the desired configuration. SAV-IOL will present Harmonis during the 36th edition of the ESCRS in Vienna on September 21-25, booth B134. About SAV-IOL: Swiss company located in the French speaking part of Switzerland. BSI site certification MD 615363. 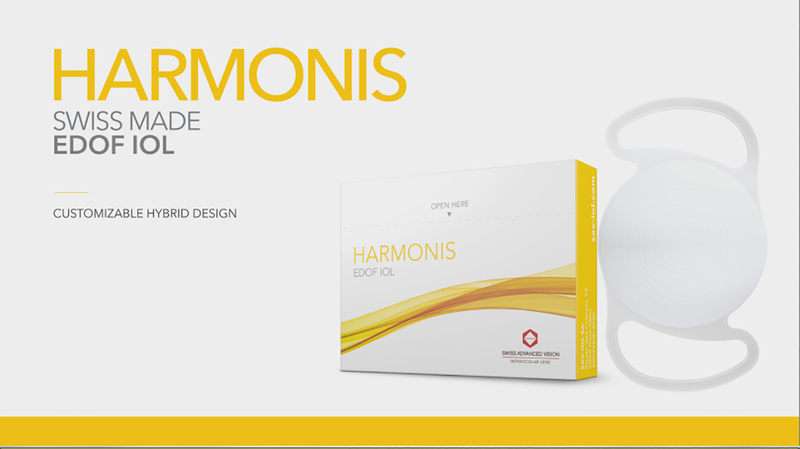 Swiss Advanced Vision launches Harmonis, the first customizable intraocular lens with advanced EDOF technology for cataract surgery.